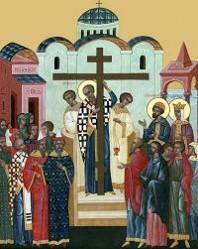 Today we celebrated Mass in the hall on the feast of the Exaltation of the Holy Cross. and the dedication in 335 of the basilica and shrine built on Calvary by Constantine, which mark the site of the Crucifixion. Unfortunately, this basilica and the shrine were destroyed by the Persians in 614 but the Crusaders built the The Church of the Holy Sepulchre on this site in 1149.